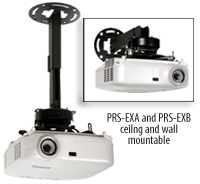 Peerless has packaged flexibility and ease together in one box with these ceiling/wall mounting kits, which enable the installation of a projector from either the ceiling or the wall. 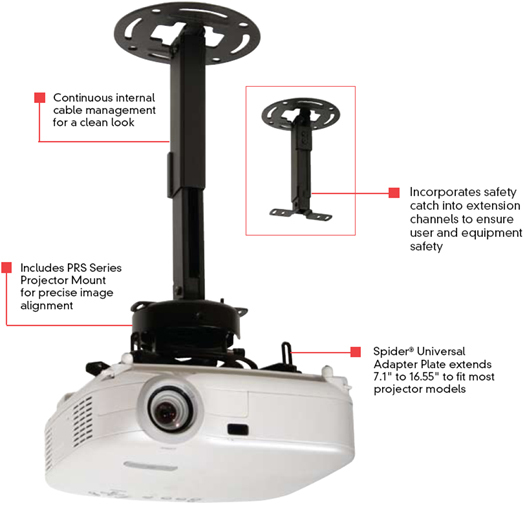 Each kit includes a PRS Series Projector Mount and an adjustable length extension column that provides ideal height positioning for the perfect projector installation. The extension column provides cable-management that organizes signal and power cables for a clean, clutter-free appearance. This complete projector mounting kit supplies everything needed for an easy projector installation in one convenient package. This kit combines the precision adjustment and low profile design of the PRS-series projector mount line with a convenient variable-adjustable square column extension kit. Each kit includes the ceiling/mount, extension column and mounting hardware for either ceiling or wall applications. You also get color-coordinated wire slot covers for neat and clean installations. PRS-EXA(-S)(-W): 6.5" - 16.55" x 8.7" - 12.8" x 6.5" - 16.55"